Cuisinart CJE-500 Compact Juice Extractor is a one-speed centrifugal juicer with blazing 19,000 revolutions per minute. Being the fastest among the fastest electric juicers, this speedster makes use of its 400-watt motor to generate thousands of RPM. With a touch of a button, you can literally turn your produce into a freshly pressed juice. Now let’s take a look at the design. I’m not impressed with the one-speed setting but the black finish and the silver/chrome embellishment looks very elegant, not to mention that it’s highly compact. If you have a limited counter space this juicer might be a good fit. The diameter of the feeding chute is 2.5 inches, it’s not that huge but it can accommodate large chunks of fruits and vegetables. This will make your preparation time a lot faster. The complimentary pitcher can hold up to 16 ounces of juice while the pulp container can catch as much as 40 ounces of pulp. With this setup, you can definitely enjoy an uninterrupted juicing experience. 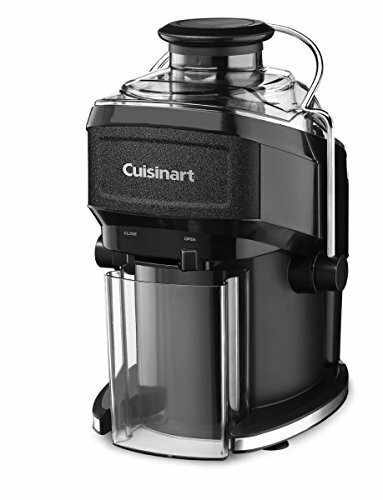 The best part about Cuisinart CJE-500 is that all removable parts are dishwasher safe and everything that comes in contact with the juice is BPA free. This juicing machine is pretty straightforward, there are just six parts to assemble and disassemble. However, the spout is a little bit smaller but you can be generous when cutting your produce. You don’t have to cut it into small pieces, instead, large chunks will do. If a whole carrot or apple can fit the 2.5-inch feeding chute, feel free to drop it there. At 19,000 RPM you’ll have your juice ready in a few seconds plus the preparation and cleanup time. All detachable parts of Cuisinart CJE-500 Compact Juice Extractor are dishwasher safe. If you don’t feel like washing your juicer manually, just rinse it off and put it on the top rack of your dishwasher, then let it do the washing for you. Otherwise, if you’re in the mood to hand wash it, just soak it in warm water with a soap mixture for about 30 minutes, then rinse it off. The hardest part to clean will always be the cutting disk and the filter basket. The complimentary cleaning brush will come in handy. To prevent going through the agony of cleaning up a mesh filter filled with hardened residue, wash your juicer immediately after using it. That’s the general rule so to speak. For fast juicers, as long as you drink your juice right away you won’t have any issues with juice quality. After 15 minutes minerals, nutrients and enzymes will start to break down in a process called oxidation. Generally speaking, you only have 24 hours to consume it. High-speed juicers tend to incorporate a lot of oxygen into the juice making it frothy. The higher the RPM the higher the level of oxidation. Since this juice maker is the fastest, it also has the highest amount of oxidation going on. One speed juicing machines will work best on hard produce and citrus fruits only. It’s not the juicer of choice for soft fruits, leafy greens, let alone wheatgrass. Hard produce includes turmeric, pineapple, broccoli, cauliflower, bitter gourd, garlic, celery, apple, yakon, sweet potato, ginger, cilantro, watermelon, beets, cucumber, asparagus, carrots, pumpkin, pepper, pear, and fennel. One thing that this juicer excels is affordability. If you’re thinking of getting a Breville BJE200XL, just get this one. It’s way cheaper plus it has an external pulp ejection, which is going to make things easier. Cuisinart CJE-500 Compact Juice Extractor is a beginner friendly machine. Its one-speed setting will give you the ability to juice hard produce and citrus fruits, nothing more nothing less. It’s good enough to get you started.